Whenever Chapel Hill, North Carolina, elected a new mayor, few people outside of the small college town paid much attention. But when the 1969 mayoral race came to a close, newspapers and magazines from around the state, nation, and world reported the news. Time and Newsweek ran profiles of the new mayor and his photograph appeared prominently in a West German newspaper. Why all the fuss? When the votes were counted and the election was certified, on May 6, 1969, Howard Lee became the first African American mayor elected in a predominantly white southern town since Reconstruction. Lee had lived in Chapel Hill only five years when he decided to run for mayor. He moved to North Carolina from his native Georgia in 1964 to attend the University of North Carolina. Lee earned a master’s degree in Social Work in 1966 and was hired to direct a research program at Duke. When Lee and his wife began to look for a home, they found that, despite the town’s progressive reputation, race was still very much an issue in Chapel Hill. The Lees encountered white residents who were reluctant to have an African American family move into their neighborhood, and realtors who hesitated to show them homes in white subdivisions. When, after six months of searching, they were finally able to purchase a home in the Colony Woods neighborhood, they received harassing phone calls and a cross was burned on their front lawn. The experience inspired Lee to enter local politics. The 1969 race for mayor set records. The 4,734 votes cast were the most in town history, and included a record turnout from the Chapel Hill’s African American community, which made up nearly ten percent of the population. The race was close: Lee’s margin of victory – about 400 votes – was the smallest on record for a municipal election. He defeated Roland Giduz, a former newspaper editor and long-time member of the Chapel Hill Board of Aldermen. 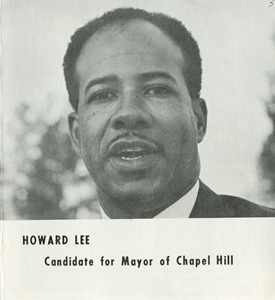 Lee served three terms as mayor of Chapel Hill. He received 64 percent of the vote in the 1971 election, and 89 percent in 1973. Lee ran for Congress in 1972 and for lieutenant governor in 1976, and though he lost both races in the Democratic primaries, his career in politics was far from over. He was appointed as secretary of the Department of Natural Resources and Community Development in 1977 and served in the state senate from 1990-1994 and 1996-2002. Lee is currently the Executive Director of the North Carolina Education Cabinet. Nicholas Graham, "May 1969: Howard Lee." This Month in North Carolina History, May 2004.